To all of our MACnificient Members! We Love This Team! and We LOVE Our Members! 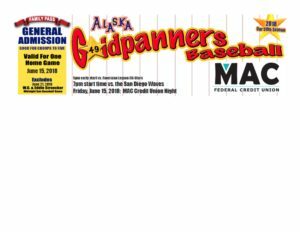 Come and watch the Alaska Goldpanners play the San Diego Waves starting at 7:00 right after they play our local American Legion All-Stars! Be sure to stop by the MAC tent and get something for the 7th-inning stretch, while supplies last!. All MAC Board Members live, work, and volunteer in our community! Our very own Tim Erickson will be throwing out the 1st Pitch! This family pass is just one way of saying Thank You for being a MAC Member. MAC is proud to sponsor of the Alaska Goldpanners Baseball.